Heat oven to 400°F. In small bowl, mix bread crumbs and milk; let stand about 5 minutes or until milk is absorbed. Meanwhile, line 15x10x1-inch pan with foil; spray with cooking spray. In large bowl, mix beef, green onions, 1 tablespoon of the garlic, 3/4 teaspoon of the salt, the Worcestershire sauce, egg and bread crumb mixture. Gently stir, taking care not to compress mixture. Shape mixture into 18 (1 1/2-inch) meatballs; place on pan. Bake 18 to 22 minutes or until internal temperature is at least 165°F. Meanwhile, in 12-inch skillet, melt 3 tablespoons of the butter over medium-high heat. Add mushrooms and remaining 1/2 teaspoon salt; stir to coat. Cook 12 to 13 minutes, stirring occasionally, until mushrooms are very tender and skillet is nearly dry. Stir in remaining tablespoon of garlic and the thyme; cook about 1 minute or until garlic is fragrant. Add 1/2 cup of the wine, stirring occasionally to deglaze skillet, and cook about 3 minutes or until most of the wine is absorbed. Stir in remaining 1/2 cup wine and the broth. Heat to simmering; cook 2 to 3 minutes or until liquid has reduced slightly. In small bowl, mix remaining 1 tablespoon butter and the flour; mash with fork to form a paste. Beat butter mixture into wine mixture in skillet using whisk. Simmer about 3 minutes, beating constantly, until paste is completely dissolved and mushroom sauce has thickened. Add meatballs to skillet; gently stir to coat. Garnish with parsley. Burgundy refers to wine from the Burgundy region in France. Although several grape varieties are produced in that region – including Chardonnay – the most common red wine is Pinot Noir. Any Pinot Noir can be used in this recipe. 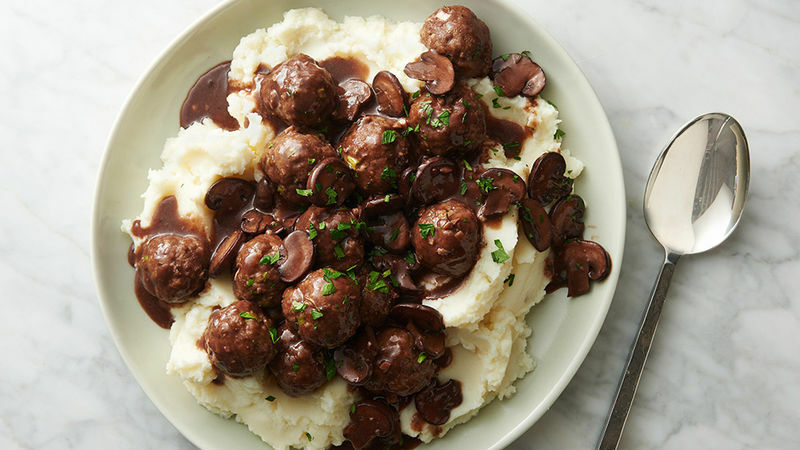 Serve the meatballs with mashed potatoes, buttered noodles or rice.